A sweet alcoholic beverage made from an infusion of flavoring ingredients (such as seeds, fruits, herbs, flowers, nuts or spices) and a spirit (such as brandy, rum or whiskey). Essential oils and extracts are used to flavor many of today's liqueurs. Artificial flavorings make a lackluster contribution to the less expensive brands. Most commercial liqueurs are made with closely guarded secret formulas. Also called cordials and ratafias, liqueurs are usually high in alcohol and range from 49 proof for cherry heering to 110 proof for green chartreuse. The crème liqueurs (such as crème de menthe) are distinguished by being sweeter and more syrupy. Liqueurs were originally used (and some still are) as a digestive. They are now usually served after dinner but also play an important role in many cocktails. Liqueurs can also be used in cooking, particularly for desserts. absinthe; advocaat; amaretto; anesone; anisette; bénédictine; Chambord; Chéri-Suisse; Cointreau; crème d'abricots; crème d'amande; crème d'ananas; crème de banane; crème de cacao; crème de cassis; crème de cerise; crème de noyaux; crème de rose; crème de violette; curaçao; Drambuie; eau de vie; Framboise; Frangelico; Galliano; Glayva; Goldwasser; Grand Marnier; Herbsaint; Irish mist; Izarra; Kahlúa; kümmel; Mandarine liqueur; maraschino; Midori; ouzo; Pernod; prunelle; rock and rye; Sabra liqueur; sambuca; sloe gin; Southern Comfort; Strega; Tía María; Triple Sec. Chai, pronounced with a chocolaty “ch” and rhyming with “sky” is a generic word for “tea” in many parts of the world. It is a sweet, exotic mixture of milk, tea, and spices. Chai’s history is over 5000 years old, with its creators enjoying it both hot and cold. Some stories say it was invented by a royal king in the ancient courts of India & Siam who protected the recipe as one of his treasures. However, its roots can be traced unmistakably to the Hindu natural healing system called “ayurveda” in which combinations of spices, herbs and tea were used for their health benefits in serving as a digestive aid. Since its beginning, chai recipes have varied, and today, they differ by region, neighborhood and even by household. Recipes are handed down from generation to generation, so that having a cup of chai does not simply mean enjoying a relaxing beverage, but also experiencing a family tradition. Today, chai is still the everyday beverage for Indian and other Asian households, where starting the day may involve enjoying a cup of chai taken from a large steaming kettle. Chai is also sold wherever people gather such as on trains, at bus stations and in marketplaces by street vendors called “wallahs” who bellow out “CHAI!” The wallahs serve the hot drink in low-fired clay cups called “kullarhs” that they make on open fires. After finishing, the cup is broken on the ground where it began just hours before. WHAT ARE THE BENEFITS OF CHAI? People drink chai socially and for its health benefits.Drinking chai is similar to how many in the US have a cup of morning coffee to start their day. Many people of India and Asia have a cup in the morning as a group, helping create a sense of community. It is also a welcoming beverage. An invitation to someone's home will include a cup of the family's chai. Serving chai is like offering a cup of a family tradition. The combination of spices, herbs and tea has a number of health benefits as well. Enjoying a soothing cup of chai is a great relaxation aid and is often thought of as a stress reliever. In addition, chai is especially known for its ability to settle an upset stomach and aid with digestion, particularly when the mixture contains fennel, a well-known digestive agent. Using a green tea base means that a cup of chai contains polyphenols which are antioxidants known to be cancer fighting agents. Many in the US now recognize green tea's salubrious properties and are even interested in trying it specifically for that reason. Also, for those interested in keeping down their caffeine intake, chai, being tea based, naturally has less caffeine than the equivalent serving of coffee. Caffeine content varies from tea to tea and coffee to coffee, based on the flavor, region of origin, and climate. Simply said, chai is a combination of spices and tea which are brewed and then mixed with milk and honey. Even though many tea drinkers prefer tea without a sweetener, chai needs one in order to bring out the robust flavors of the spices. Recipes differ by neighborhood and even by family, so there is no limit to the number of recipes, but there are some essentials. Traditional chai is a mix of sweet and savory spices such as cloves, cinnamon, star anise, cardamom (which is a base spice in almost any chai), peppercorn, ginger and sometimes fennel, which are ground and boiled in water. Black tea is then added to the spice mixture which is steeped to preference, strained, then combined with cow, goat or buffalo milk and sweetened with honey. Latte art or coffee art refers to designs created on the tops of espresso based drinks by a barista. These designs are usually created in one of two ways and sometimes using a combination of both. The first method is by manipulating the flow of milk from a jug into the espresso (known as free pour latte art). The second is by drawing designs with an implement (known as etching), using stencils, powders and milk foam. Latte art is most commonly seen on a latte, although it can also be part of the presentation of a cappuccino, a caffe mocha or even an espresso macchiato. 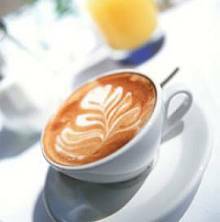 As the popularity of premium espresso-based drinks has risen, the craft of garnishing through latte art has as well. With the rise in popularity of latte art and artistic presentation in the cup, competitions have emerged all around the world to enable practitioners (baristas) to show off their skills. Latte art is considered by many consumers of coffee to be the final, crowning touch on an exquisitely prepared espresso-based beverage. Because of its visual presentation to the customer and beverage drinker and the increasing importance latte art has in cafes around the world, there is concern that taste should never become secondary to the art. In latte art competitions and in barista discussions, practitioners of latte art are frequently encouraged to first and foremost be attentive to the quality of the espresso and the steamed milk before consideration is given to how the drink should be completed with eye catching art. This technique is performed to create a smooth and sweet milk that can be poured into heart and flower patterns. Although the ability to pour a pattern into a cappuccino does not indicate quality in itself, it is indicative of the passion of the barista. The ability to pour patterns into drinks will let your customers and friends know that you are serious about espresso. Whole milk, straight walled steam pitcher, an espresso machine with a powerful steam wand, thermometer, and a 14 oz latte cup. Prepare the milk first, then the espresso. 1. Begin with very cold milk. It is important to keep the milk temperature right above freezing. Keep the steam pitchers in the refrigerator also. This will allow you to steam for a longer period of time to achieve the smooth and velvety texture that is required to make latte art. 2. Fill the milk pitcher with the right amount of milk for one cup. You will probably have some milk left over after steaming. Start with fresh milk for every cup. 3. Place the steam wand at the bottom of the pitcher. Turn the steam on, and slowly raise the wand so that it is near the top of the milk. As the milk rises, lower the pitcher so that the steam wand remains approximately 1 cm from the top of the milk. Stretching should be minimal, no big bubbles should be formed. The key is to get smooth velvety milk, not the thick foam that floats above the espresso. When poured, the milk should flow into and mix with the espresso. 4. When the milk has reached 80 degrees F/26 degrees C, push the steam wand deep into the milk on the side of the pitcher, and position the pitcher to spin the milk counterclockwise. Continue the spinning motion until the milk reaches 150-160 degrees F/65-71 degrees C. Steaming over this temperature limits the sweetness of the milk. After stopping the steam carefully remove from milk and clean with wet cloth. Remove thermometer from milk. 5. Swirl milk vigorously. If any bubbles are visible pound the pitcher on the counter several times. Swirl after pounding. I recommend swirling for 20-30 seconds. This can be done effectively while the espresso is pouring. 6. Begin pouring milk into the espresso. Pour milk into the bottom portion of the cup, approximately an inch from the bottom of the cup. Pour gently into one spot and do not shake the pitcher. As the cup is about half filled, begin to shake the pitcher back and forth while slowly moving backward. The flower pattern will move forward and fill the cup. I have found that a shaking motion via movement of the wrist is better than physically moving the hand back and forth. 7. When the milk reaches the top of the cup, weep through the pattern you created by quickly pouring the milk up the center of the pattern. Pouring less milk here is better because it will not sink the flower pattern. To pour a heart pattern, shake as you were doing above, but do not move backwards as much. Concentrate on forming a ringed circle and then slowly sweep through to form a multi-layered heart.